Davis had helped bring Molly, a Vietnamese potbellied pig, back to health after she and dozens of other pigs ended up in the care of the organization after a cruelty investigation and subsequent rescue operation. In mid-January, a Vancouver Island couple adopted Molly from a local BC SPCA branch, the Global News reported. Shelter workers believed they were sending Molly to a great home. But weeks later, a local woman saw reports on social media indicating the couple had slaughtered and eaten Molly, apparently because they found keeping and training a pet pig to be more work than they could handle. The BC SPCA contacted local law enforcement, who confirmed that the family had indeed slaughtered and consumed Molly, BC SPCA spokeswoman Lorie Chortyk told People. However, because law enforcement determined the slaughter was done humanely, there’s not much action the BC SPCA can take. 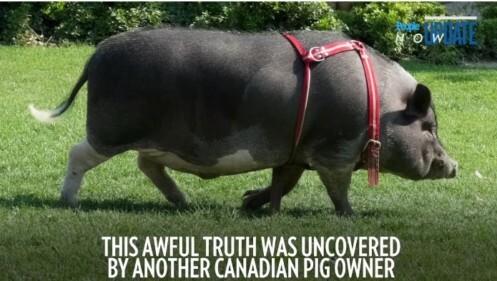 The adopters had signed a contract saying they would not use the pig for food, but Davis told the CBC that breaching the contract was not a criminal offense. However, they will be blacklisted from adopting any other animals from BC SPCA in the future. He noted that the shelter would have happily taken Molly back into its care if the couple had returned her, rather than eating her. Brandy Mckee, who initially alerted the BC SPCA about what happened, told HuffPost Canada that a friend had even offered to pick up Molly from the couple’s home and bring her somewhere safe. Though potbellied pigs are intelligent and can make wonderful companions, caring for them is a big commitment. The Pig Placement Network notes that the pigs can live between 12 and 15 years and typically weigh between 80 and 160 pounds. They also need plenty of space (including outdoor space), a “pig-proofed” home and specialized vet care. While potbellied pigs are sometimes referred to as “mini pigs” — since they are smaller than domestic farm pigs — don’t fall for scams advertising tiny “teacup pigs” that appear to be only a few pounds. So-called teacup pigs are only so small because they are piglets. They eventually grow into full-size potbellied pigs unless they are intentionally starved to keep them smaller. In some cases, even young farm hogs are passed off as teacup pigs or potbellied pigs — like Esther the wonder pig, whose owners adopted a “mini pig” only to wind up with a pet weighing 500 pounds.